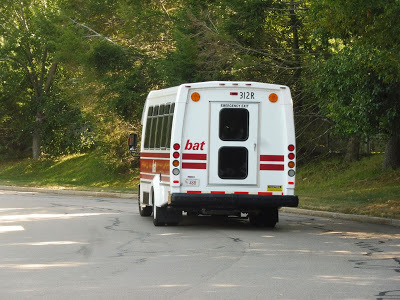 This was a pretty interesting minibus. For one thing, it put its jiggly wheelchair lift in the front of the vehicle, which actually makes a lot more sense for the driver and for convenience of boarding. 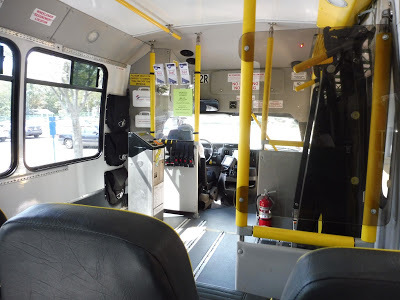 It also meant that they could clear a big space in the front of the vehicle for wheelchairs, meaning that the farebox (complete with CharlieCard support) didn’t eliminate a seat pair! We headed out from Signature Healthcare and followed the 5 down Centre Street. There were some suburban businesses at first, but it soon became houses mixed with industrial buildings. 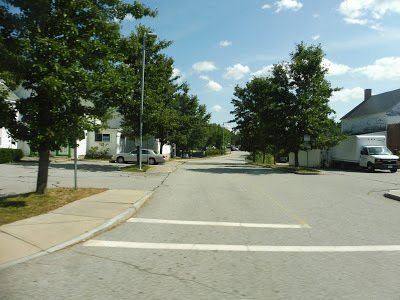 They continued as we entered Abington and the street became Brockton Ave, then we deviated into Walmart, where someone – a loyal rider, given her familiarity with the driver – got on. 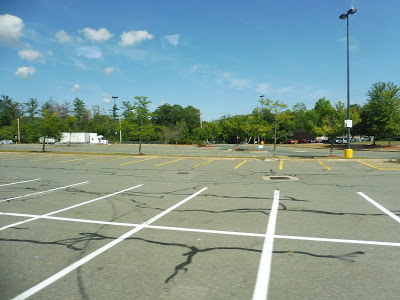 Whereas the 5 ends here at Walmart, we sped off into the great unknown of Abington. 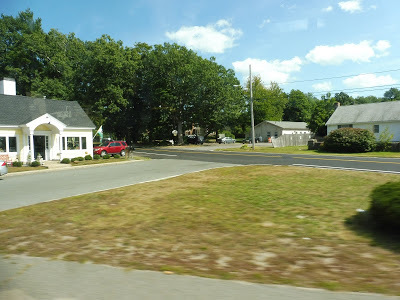 Seeing me taking pictures, the passenger and the driver started to tell me about the route and how it works – the bus will pick a passenger up at any point in Rockland, but only in Rockland, and in other towns it will only stop at timepoint stops. 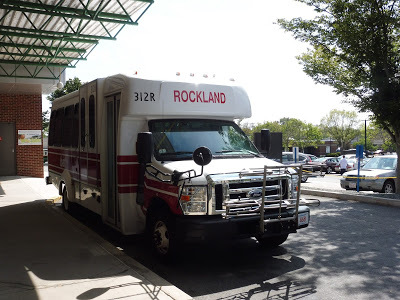 Also, in Rockland, passengers can call in before 4 PM the previous day to deviate the bus to where they want to be picked up. If the website is to be believed, there’s apparently no distance limit! Splitting off from another road. There was a section of woods, then it was just a mixture of everything: there were houses, businesses, and industrial buildings. We turned onto Washington Street in what appeared to be an Abington Center-type place: there were dense houses, and a few of them contained businesses. Just after leaving the “center,” we turned onto Centre Ave, at first passing mostly houses and a lake. There were a few businesses around Abington Station, and we crossed the Commuter Rail track at street level. I asked the driver if the station was a big ridership generator; he said he gets a few commuters who use it every day, but he’s not allowed to drop them off at Abington. Huh? Well, the answer became clear after we drove for a little while longer and pulled into a Stop & Shop. Since this is a timepoint stop and Abington isn’t, the driver is forced to drop people off here and make them walk to the station! The back of the Stop & Shop. It turned out that this was a double deviation – we also had to serve a Target within the same complex. 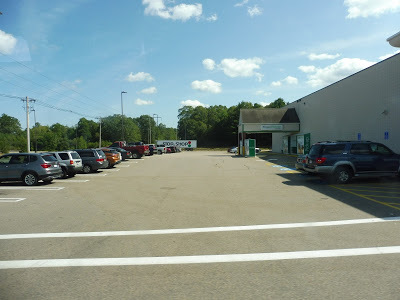 But with that out of the way, we came back onto Centre Ave, and after a few more small shopping plazas, it got mostly residential and we entered Rockland. 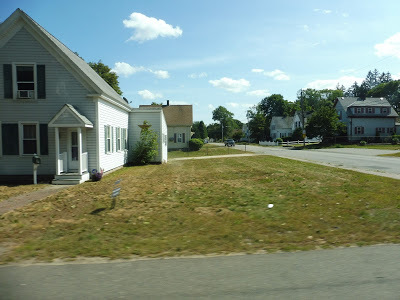 Merging with Market Street, we curved around past lots of suburban businesses with parking lots before sailing past some houses to get to an Ocean State Job Lot deviation. A residential area along the way. We headed back down Market Street, then we turned onto Concord Street, entering a residential neighborhood. “Hey, free pool table!” the driver exclaimed as we went by some furniture someone had left outside their house. Next, we turned onto John A. Dunn Memorial Drive, which led us past a housing development called Studley Court. 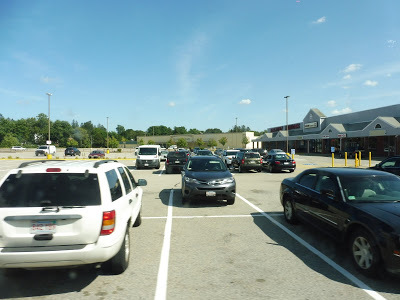 We then made our way into – ahem – “Rockland Plaza,” one of the most barebones shopping plazas I’ve ever had the misfortune of having to deviate to. It consisted of a liquor shop, a laundromat, and a huge church in a generic shopping plaza building. We headed up Union Street from there, which was lined with pretty dense houses. Eventually those houses turned into businesses, and we were in Rockland Center. There wasn’t much on offer, but it was better than nothing. Finally, we looped around at the Rockland Community Center, and that was the end of the route. On the way back, I asked the driver if he could let me off at Abington Station, but of course, I had to get off at Stop & Shop instead. As I began the trek down Centre Ave, I heard a flurry of horn toots. The bus sailed past and the driver stuck his head out the window yelling, “THERE HE IS! THERE HE IS!” Wow, what an awesome guy! Ridership: I can’t find any exact numbers, but signs point to very low. My round trip had just three other people, although I will say that they all knew the driver and seemed to be loyal riders – the route has, for lack of a better term, a cult following. Pros: This is the only bus route that serves Rockland, so I guess that’s something. Also, I hope I’ve made it clear that the driver on this route was fantastic. He was funny, talkative, and accommodating, and he made this ride great. Cons: Aw geez…the route just isn’t very good, is it? 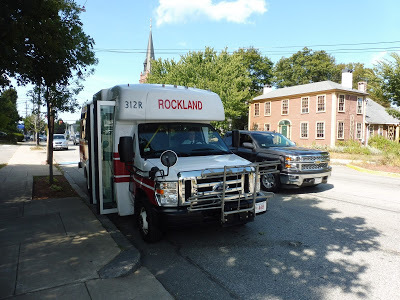 It serves as a little Rockland circulator, but it only connects up the center of town without serving any residential areas. And sure, I guess it can be “flexed” for that purpose, but it’s a real pain to have to do it the day before. Even though the schedule doesn’t cater to commuters at all, it seems like people do use it for that purpose, but it’s like the route is working against them! There’s no stop at Abington, and service begins too late and ends too early. Oh, and the schedule: it’s every hour and fifteen minutes, weekdays only. What’s the problem with that? It doesn’t time with the 5! Okay, that’s an overstatement – most of the trips do time. Still, I think it would be best if the schedule made it more clear which ones you can use to transfer, and in which direction. Nearby and Noteworthy: Apparently Rockland is a rather boring town. Sorry, Rockland! Ehhhhh…if I didn’t have such a great experience riding the route, it might’ve even been a 2. This route just doesn’t seem very useful, serving mostly retail and few residential areas. Flexing is annoying to use, so I can’t see many people doing it, and the route seems to get commuter traffic but it makes their trip as hard as possible. It could probably just be replaced with a public dial-a-ride service within the town of Rockland.